If you have been reading my blog for very long at all you will know that I love Boppy. I have had the pleasure of featuring a few of their great products like the Boppy pillow, Boppy Travel pillow, and the Boppy Nursing cover. I use all of them on a regular basis. When I heard from Boppy that they have a new Boppy Nursing Pillow and wanted me to try it out I was immediately excited. 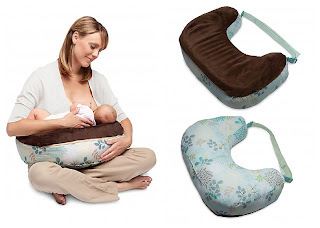 The Boppy Nursing Pillow was designed by a lactation consultant just for nursing. It has two sides for successful support. One side is contoured foam that cradles baby to mom and helps with latching. The other side is soft and provides baby a comfortable cushion for feeding. The pillow has a belt that clips securely into place on both sides. The pillow is made to fit most waists. The belt can easily be removed and the clips tucked away for easy wash in the washing machine. It is easily cleaned with a wipeable foam and machine washable pillow. It comes in your choice of two designs, Thimbleberry and Pinewheels. I received the Thimbleberry print and I love it. Since I received the nursing pillow I have used daily. It works great. It is thicker then a regular Boppy pillow, which helps baby get closer to latch. I think it seems to be more open then the original Boppy making it have a larger range of fit for moms. It is easy to clean. I don't tend to use the belt and I like that the belt can be removed when washing or just not in use. I really like the new Boppy Nursing pillow and it works great for us. Jayden thinks it should be his pillow and likes to lay on it when I'm not using it. Thank you to Boppy for sponsoring this post and giveaway. I would want to win this for me! We just welcomed our new nursling 3 days ago, so it would get a lot of use! I learned that Boppy started in 1989. I love this. I have always loved the classic boppy pillow, but I am very interested to try this new nursing one as well as the travel one! I learned that Boppys were created in 1989! I had no idea they had been around that long. I want to win because I'm expecting #4 in Aug/Sept, and all of my other kids have their own Boppys. I want to make sure the new one will get to have one, too! The maternity pillow looks great for sleeping. This would be perfect to use with my soon-coming little one. Oh I also love the Flying Circus Play Gym! So cute! I learned that Boppy also makes play-mats and I am all about the flying circus one. I love that bright orange! I would like this for myself. I am expecting baby number three in June and I am planning on breast feeding. I also like their Garden Patch Playmat. This would be for my daughter who is having her 2nd baby in April - so excited! I like they are taking request to design the next boppy cover. I love my Boppy! I didn't realize they had a new Custom Fit Total Body Pillow. I would love to try that out. I love the newborn lounger! I like the Flying circus play mat! i learned they make play gyms. I love the travel hoppy pillow. I am having a baby in April so I would love to have this. I like the Flying Circus Play Gym! I like the contest to choose the next Boppy print. I like the Boppy Custom Fit Total Body Pillow. I would like to win this for myself and my new baby. I am really into the new design! I love how it has a harder side and a softer side. I think this would really help with nursing my soon to be second! The first time it didn't work out that well but I'm informed and determined this time around! Oh I would love to win this for my little sister who is due in about a month! I like that they offer a variety of slip covers for the Boppy pillows. I like that there is a soft and firm side, plus it is machine washable! I learned the entire pillow is washable. Love that!